Tomato Sandwiches. Harriet the Spy. What was sickening about a tomato sandwich? Harriet felt the taste in her mouth. Were they crazy? It was the best taste in the world. Her mouth watered at the memory of the mayonnaise. England smells of summer this week. Of newly mown grass, of rain hitting hot tarmac, of the wisteria that hangs from brick walls, and of fields of wild garlic. I’ve been walking a lot – even in the rain – soaking it all in. At the greengrocer, the produce has shifted too, and space has been cleared for asparagus and radishes and punnets of strawberries. And, of course, English tomatoes. Such is our desire for the ubiquitous tomato that they are available year-round, in corner shops, farm shops and supermarkets. From November – April, their insipid orange-red hue is useful in alerting us to their sub-par taste. Winter tomatoes are a disappointing sibling of their glorious summer cousins – they may as well be a different food. It’s a time to reach for the tinned variety, which carry me through the colder months. But when May arrives, with longer evenings and warmer days, the smell of tomatoes is overwhelming, and I am rarely without a bag or box of them in the kitchen. When I was at school, my mum was famous for her sandwiches. They were spectacular feats of engineering, loaded high with chopped salad and some form of meat, fish or cheese. They were also as far from soggy school sandwiches as it is possible to be; somehow the lettuce always stayed crisp, and she wrapped slices of tomato and tinned beetroot separately for us to add ourselves once morning tea rolled around (I could never save them for lunchtime). At my sister’s Hen’s night a couple of years ago, a friend of hers revealed that she frequently used to swap her tuck shop money for ‘Deb’s sandwiches’, leaving Luce with a meat pie, while her friend enjoyed my mum’s packed lunches. A very funny discovery, years after the fact, but I couldn’t help thinking that you’d have had to prise those sandwiches out of my cold, dead hands. I have never quite had the knack my mum had, and so my years of packed lunches have mostly consisted of leftovers, batch cooking, or salads. Now freelance, and working next to a kitchen all day, I am rediscovering a love for lunchtime sandwiches. After all, when you’re eating it immediately after assembly, it matters less that the ingredients might make the bread a little soggy. And so, though I had hundreds to choose from (books, especially those for children, are littered with mentions to sandwiches), I wanted to recreate Harriet’s favourite tomatoes sandwiches this week. A final note: mayonnaise is endlessly flexible in terms of flavours – play around with what works for you. If you prefer olive oil, use that. If you’d rather lemon juice or white wine vinegar in place of the cider vinegar, do so. If you don’t like English mustard, put Dijon in instead, or try it with a spot of Wasabi. There are so many options. It’s so quick and simple that I’m forever looking for excuses to make another batch. For this to be a really great sandwich, all ingredients (those for the mayonnaise, as well as the tomatoes and bread), need to be at room temperature. 1. To make the mayonnaise, put the egg yolk in the bowl. Whisk it for a minute or so until it is sticky and has bubbles. Add one teaspoon of the vinegar and whisk again until combined. Put your oil into a jug or bottle that is easy to control. 2. Start dribbling the oil into the egg yolk, one drop at a time, whisking continuously. Keep your eye on the oil, not on the bowl. The moment you take your eye off it, you’ll accidentally pour a great big glug in – trust me. 3. Keep whisking until the egg and oil mix resembles thick cream. Once it does, you can start being a little more generous with the oil, adding up to a teaspoon at a time. When you have about 2tbsp of oil left, add the second teaspoon of vinegar. Whisk well. The consistency should be thick and spreadable, and stiff enough to hold the pattern that forms when you drag the whisk through it. If it is not quite there, gradually add as much of the extra oil as you need. 4. Try the mayonnaise and add mustard, pepper and salt to taste. Eat it immediately. No cling film, no lunchbox, no soggy bread. Gooseberry Tart. Swallows and Amazons. There's something truly wonderful about an English summer, especially in the countryside. Thus far this year, I have not had much opportunity to enjoy time outside of London (bar a one day excursion to the Devon seaside), but the long days, fields of green, cool evenings and bright blue skies are hard to beat. I still prefer winter, but as someone who grew up hating summer - it is borderline unbearable in Brisbane - I've found myself charmed by summer in my adopted country. I am particularly attached to those fruits and vegetables that appear only in these warmer months; asparagus, plums, tomatoes and gooseberries grace my plate with alarming regularity while they're in pride of place at my local greengrocer. Until I can find time to escape London and lie in a field somewhere with a book, I will be living vicariously through the Swallows and Amazons. This lovely novel captures a magical summer spent by a group of children as they sail their boats, enjoy picnics and explore a series of tiny islands in the Lake District. It's the childhood I would go back in time and have if I could - escaping home for days and camping with my sister and a picnic basket full of food. In the absence of time travel, I decided to make a gooseberry tart instead. 1. First, make your pastry. Put the flour, salt and icing sugar in a bowl and chop the butter into small cubes. Toss the butter in the flour and then rub together with your fingertips (not your palms - you want to keep everything cool) until the mixture resembles breadcrumbs. Add the egg yolk and mix with your hand, until the pastry comes together. If you need more liquid, add a very small amount of the iced water. Don't overwork the dough; as soon as it has come together, wrap it in cling film and place it in the fridge. 2. After an hour in the fridge, place the pastry between two pieces of greaseproof paper. Roll it out until it is large enough to fit in your tart tin, with a bit of overhang. Move into the tin, easing the pastry into the corners, and ensuring it is pressed into the ridges. Trim the edge with a small, sharp knife and prick the base with a fork. Lay a sheet of greaseproof paper (one of the ones you rolled it between would work) in the base and fill it with rice or dried beans. Return the tart case to the fridge for 30 minutes. Preheat the oven to 200C and place a baking tray in the oven to heat up. 3. Place the tart in the oven, on the baking tray, and bake for 15 minutes. 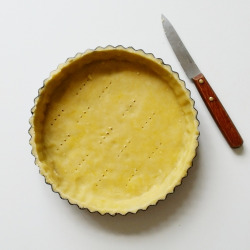 After this time, remove the greaseproof paper and beans and return the pastry to the oven for an additional five minutes, until dry and golden. 4. While the pastry is in the oven, prepare the filling. In a mixing jug or bowl, whisk the egg yolks with the honey until combined. Whisk in the cream and cordial. Trim the tops off the gooseberries. 5. When the tart case is baked, tip the gooseberries into it. Fill it up with the custard, being careful not to completely submerge the fruit. Bake for 40 minutes, until the custard is set in the middle. Allow to cool for ten minutes in the tin, and then 30 minutes on a wire rack. Dust with icing sugar, wrap in greaseproof paper and a cloth, and add to your picnic basket.